Federal legislation — in the form of Title IX — led the way for girls and women to participate on an equitable playing field. Before Title IX, which required gender equality for boys and girls in every educational program that gets federal money, just 7 percent of high school athletes were girls. Today it’s about 40 percent — leaving plenty of room for improvement. More schools and organizations are providing girls sports activities, which is illustrated in the explosion of camps, classes and lessons now being offered. It can be tough to sort through all the opportunities. High schools, colleges, recreation centers and private companies all offer sports camps aimed at making girls more skillful, stronger, confident team players. Lacrosse and soccer are the hot sports for girls today. Most facilities, such as Pinnacle Sports in Medina, a sports training facility, have sports camps in which boys and girls are participating together, with teams generally divided by skill rather than gender. The exception is softball and girls lacrosse ­because the games are either gender- specific or the rules (lacrosse, for ­example) vary widely for girls and boys. Rich Garbinsky, general manager of Pinnacle Sports, has been in the youth sports business for 30 years and has seen a lot of changes, not just in ­participation but also in the range of sports that draw girls and young women. Garbinsky is on the national board of directors for the American Camp Association (acacamps.org) and is a state ACA representative. The group has a list of ACA-accredited sports camps and resources for finding a good camp fit. Before beginning a sports camp search, Garbinsky said parents should figure out what they want out of a sports camp. For example, is skill development the most important take away, or is strength training, teamwork or nutrition information important? A good place to start is the ACA website because the options can be overwhelming. The group’s camp standards can help whittle options. Ask about the instructors’ experience. Will teams or camps be single-gender or have both boys and girls? Learn about what happens each day of the camp, the schedule and the ­expected outcome. Northeast Ohio has many options for girl’s sports and skills camps and colleges are a good place to start. Nicole Loudin is responsible for softball camps and clinics at John Carroll University. A January clinic drew about 20 high school girls. Parents can encourage girls to take advantage of sport benefits by taking them to women’s games, finding a sport that suits their personality and building physical activity into their daily activities. The Women’s Sports Foundation Go Girl Go! Program recommends letting your daughter know that it’s okay to sweat and to be athletic. 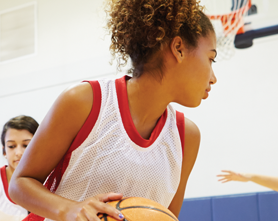 The foundation advocates for girls’ sports access. Also, injury prevention is something that coaches like Loudin and others take seriously. “My goal with camps and clinics is to see athletes become more fundamentally sound so that they can play a large number of games and reduce the risk of some overuse injuries,” Loudin says. Sports camps — whether divided by gender or skill level — can help girls of all ages. Exposure to positive sporting experience will lead to a lifetime of good health and good decision-making.